In theory, it should have worked. I mean, it was a simple matter of travelling 500 million years back in time, grabbing a live specimen of a species now long extinct and return. In theory. But as is the norm, something tends to go wrong when time travel is involved, and unfortunately this was no exception. So grab your hammer and help Gemma figure out what’s what, in this Metroidvania blast from the past! I’m not quite sure where this game takes place, but based on the enemies you’ll be facing, chances are it’s not Earth at least. Then again, does it really matter? Probably not. There are enemies in need of a good beating with that mighty hammer of yours and that’s what’s important! Who doesn’t like a good 2D action romp through time, after all? Especially one as non-linear as this, or as the developer puts it, “the game is relatively open in terms of sequence breaking”. 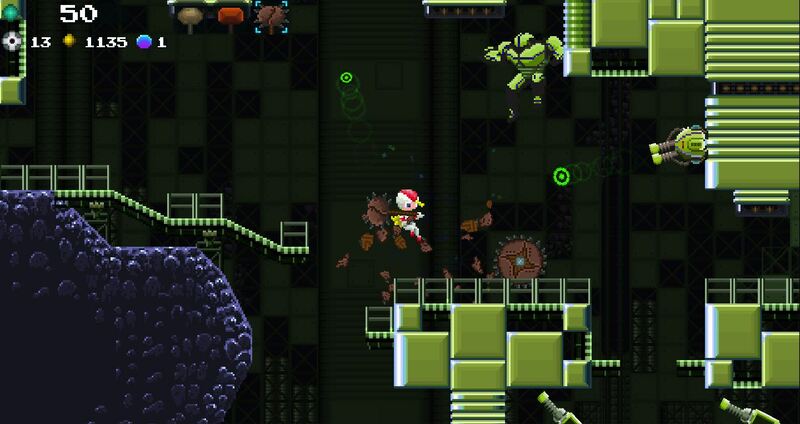 Something tells me Metroid fans – and speedrunners in general – are gonna have a field day with that. Use your map to better navigate the complex and find what paths you missed the first time. With no invisible walls, load times or tutorials at all, it’s up to the player how to progress and where to go. Almost. Certain areas are inaccessible (or simply too dangerous), until you’ve acquired a specific item or ability, in true Metroidvania fashion. Gotta love it. Also, pray tell, when was the last time you got to beat the living daylights out of someone in a video game, with… a hammer? A hammer! I’m fairly certain you’ll come across other, much more deadly weapons throughout the game, but come on – a hammer! Sounds like a vital component to me. Operation Smash is available on Desura for $8.99 ($7.19 for the next five days), for Windows, Mac and Linux. It’s… HAMMER TIME!